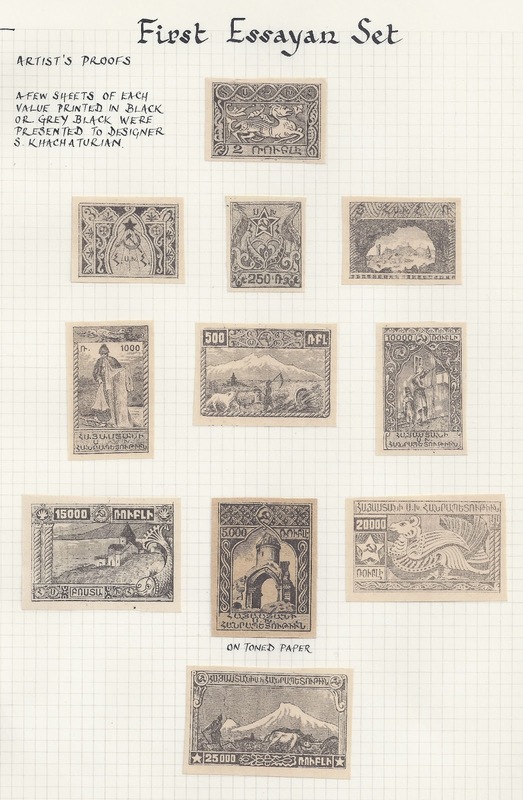 The Transcaucasia collection of the late Peter Ashford (P.T.Ashford, 1925 - 2010) was recently sold at auction in England. It was not a very large or very impressive collection, but it had been assembled over 50 years - beginning in the 1950s - and did include many items of interest. Ashford is best known as the author of several important philatelic works: on Batum, Georgia, the Transcaucasian Railway, the cancellations used in Transcaucasia during the Imperial period, and in collaboration with Tchilingirian, a pioneering work on the stamps of independent Armenia. Many of these works date back to the 1950s and Ashford's collection contained a great deal of material used in writing the books. I will publish some examples of material in the collection in my next few Blogs, concentrating on items which which I have not seen illustrated elsewhere or which are interesting and unusual. This story is consistent with the story Christopher Zakiyan tells about another issue, the First Star Set of 1921. As I noted in a previous Blog about that issue, the new Soviet government of Armenia in effect funded a trip by Khachaturian to Constantinople by supplying him with a small quantity of First Star overprints which he was allowed to sell there. Giving him some Proofs to sell as a way of paying for his more important work and foreign travels during the preparation of the First Yessayan set must have been an economical choice for the new Soviet Armenian government which had very little money to spend on anything. (As an aside, after 1991 the new Armenian government appears to have distributed New Issues via its new Embassies as a way of raising funds in local currency).